“Immediate or early skin-to-skin contact after a Caesarean section may increase breastfeeding initiation, decrease time to the first breastfeed, reduce formula supplementation in hospital, increase bonding and maternal satisfaction, maintain the temperature of newborns and reduce newborn stress” (Stevens et al 2014). This was the conclusion of Stevens et al (2014), who published a review of the literature on this topic earlier this year in an article which is freely available online. In another paper due out in the August 2014 issue of the Journal of Human Lactation, de Alba-Romero et al (2014) discuss how they developed and implemented a multidisciplinary strategy for all health care professionals involved in caesarean births which aimed to facilitate the initiation of immediate skin-to-skin contact (regardless of chosen feeding method) and recognise the importance of the woman having a companion present for support during the cesarean section. Immediate or early skin-to-skin contact after a Caesarean section: a review of the literature. The World Health Organization and the United Nations International Children’s Emergency Fund recommends that mothers and newborns have skin-to-skin contact immediately after a vaginal birth, and as soon as the mother is alert and responsive after a Caesarean section. Skin-to-skin contact can be defined as placing a naked infant onto the bare chest of the mother. Caesarean birth is known to reduce initiation of breastfeeding, increase the length of time before the first breastfeed, reduce the incidence of exclusive breastfeeding, significantly delay the onset of lactation and increase the likelihood of supplementation. The aim of this review is to evaluate evidence on the facilitation of immediate (within minutes) or early (within 1 h) skin-to-skin contact following Caesarean section for healthy mothers and their healthy term newborns, and identify facilitators, barriers and associated maternal and newborn outcomes. A range of electronic databases were searched for papers reporting research findings published in English between January 2003 and October 2013. Seven papers met the criteria. This review has provided some evidence that with appropriate collaboration skin-to-skin contact during Caesarean surgery can be implemented. Further evidence was provided, albeit limited, that immediate or early skin-to-skin contact after a Caesarean section may increase breastfeeding initiation, decrease time to the first breastfeed, reduce formula supplementation in hospital, increase bonding and maternal satisfaction, maintain the temperature of newborns and reduce newborn stress. Stevens J, Schmied V, Burns E et al (2014). Immediate or early skin-to-skin contact after a Caesarean section: a review of the literature. Maternal and Child Nutrition, 10 April 2014. Online version published ahead of print. Can u briefly share how you do it as midwives put hurdles and excuses when they have to implement.Some of the excuses they put are amongst others : it is impossible put the baby on the mother’s chest without contaminating the operation area, others citing theatre cold neonate will be susceptible to hypothermia, etc.We need to really implement skin to skin for caesarean births.We dont have a problem with vaginal birth. I am going in for c-section number 3 in 3 weeks and so glad to see this. I have experienced such hostility and even had a nurse call my child “her baby” when I have talked to them about BF and StS, as a new momma and a nurse this disturbed me and infuriated me. I have been talking to my dr and my husband about StS after my c-section since the beginning, and how I need their help to be my advocates with the nursery nurses. At Cape Coral Hospital in Cape Coral, Florida this is routine. 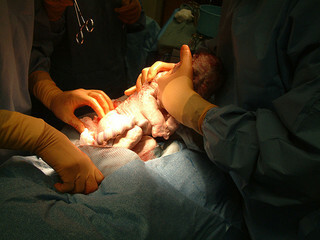 It is very rare that we do not put babies skin to skin after cesarean. We even had a mother with triplets do it last year and all three of her babies latched in the Operating Room! I spoke about this at the Association of Women’s Health Obstetric and Neonatal Nursing(AWHONN) convention in June this year. Nothing like it! Once you start, you know it is the right thing to do for mothers and babies. I would be glad to talk to anyone about it! I had a emergency c-section 7 weeks ago and I did not have the skin to skin contact till after. My husband was there and he held the baby to my cheek, but I would really have liked to have had skin to skin contact right after. I had a hard time with breastfeeding and was depressed for awhile. I had an emergency caesarean with my second baby here in the UK while we were on vacation, so he was born at a different hospital from our local one. Although there were complications in theatre (and sadly my husband couldn’t be there as he was looking after our toddler) I asked for skin-to-skin right after he was born and as his agpar score was good they obliged. The nurse held him on my chest for 20 minutes and he then even latched on straightaway once I went through to the recovery room, even though this was over an hour later due to complications with an artery in theatre. I didn’t have any problems breastfeeding and bonded with him immediately and strongly. It was a slow recovery for me but breastfeeding went smoothly from the start. This was in sharp contrast to what happened with my first son 2 1/2 years earlier. He was delivered in theatre with forceps following an exhausting 27-hour labour and 3 days of latent labour at home. I also had a 3rd degree tear and my husband held our baby and I only got a quick glimpse of him before he was whisked away while I was stitched up. There was no discussion about skin to skin even though I’d requested it in my birth plan. It was about 2 hours before I got into recovery and he wouldn’t latch on. Because of my tear I couldn’t sit for 6 weeks and had to learn to breastfeed lying down in hospital. I was there for 5 days. I was also forced by the midwives to supplement him with formula and to try to breastfeed and express every 2 hours day and night. I really struggled to get my son to latch. I was also exhausted and stressed and didn’t bond with him for several months. I felt I had no motherly instinct and that I was doing a poor job in spite of trying so desperately hard. I suffered from postnatal depression which I couldn’t shake off for 18 months. Nonetheless I was very determined and persevered with breastfeeding and nursed him exclusively once we got home and then continued to breastfeed to 22 months. I know that skin to skin would not have been the only factor which led to my very different experiences with my two boys, but I’m very sure it played a part. I wanted to share my story because, even though you contrast vaginal births and caesarean births, perhaps the bigger contrast is between instrumental births (especially in a theatre environment) and non-instrumental births. In hindsight it wasn’t made clear why I was not offered skin to skin when my first son was born, but I was told that “it is down to the discretion of the individual anaesthetist and surgical team in the theatre at the time”. So even though I had made the request for immediate skin to skin in my birth plan it was hit and miss whether that request would be granted, and it was simply bad luck that it wasn’t in my case. I am glad to read this info! I have a 3 yr old that was delivered emergency c-section after 22 hrs labor. I requested StS contact initially, but had such difficulty with fever and severe shakes, didn’t get skin to asking for several hours. My daughter has no trouble latching fortunately, but unfortunately, my milk never really came in. At about 10 days later, I started to get 0.5oz…never anymore than that, and it dwindled down slowly from there. I nursed/pumped every 2-3hrs and got no where. I was very frustrated and also suffered with not really bonding with my daughter and some post partum depression for about 6-8wks. I am now expecting my second child in 3 months with a planned c/section and will definitely talk with my OB about this info. Maybe it will be the kne thing that helps:) I’m hopeful that I will have no difficulties nursing this go-round! It saddens me that its taken so long for this to be realised, having to have a c-section for my 1st due to breech presentation (don’t get me started on that one!) I was denied skin-to-skin for almost an hour after delivery, I then got a few hours of cuddles before heading to the PN ward, where after not being allowed (that’s what the midwife said!) to hold my baby in the bed and try to latch him on, he was placed in the cot for another 4 hours before I had to get my poor partner, who had had no sleep, to return to the hospital just so I could hold my baby! I battled with trying to breastfeed but he just wouldn’t latch on… I personally blame the limited skin-to-skin we had during the 9 hours after his birth! My subsequent children -VBACS! I had immediate skin-to-skin, and they fed beautifully, to me it really does speak volumes!